There are now twice the number of connected devices on the planet than humans. From smart meters and thermostats to pumps, smart motors, sensors, and robots, there is no lingua franca in the IoT. Amid competing technologies including Wi-Fi, Bluetooth, cellular and radio frequency, and many iterations of each, the communications landscape is confusing. The Internet of Things – so often used only as slang for enabling devices to become 'smart' – has a missing link. What does the regular IoT use? While consumer devices have relied largely on Wi-Fi and Bluetooth – thanks to their inclusion in smartphones, tablets and everything else created for the home – industry has been using Wi-Fi and ZigBee. The latter, also known as 802.15.4, is expected to increase almost fivefold in popularity over the next five years, rising from just under 425 million today to over 2.1 billion in 2019, according to ABI Research. "The low-power, low-cost, mesh networking capabilities of 802.15.4 networks make them the primary wireless technology choice across a number of different vertical markets including home, building and industrial automation, smart metering, and home entertainment," says Andrew Zignani, Research Analyst at ABI Research. ZigBee is expected to see its strongest growth in the home automation market, where the share of total ZigBee shipments will rise from around 9% today to 28% in 2019. However, the industrial IoT has other plans. Bluetooth, Wi-Fi, cellular or radio frequency? In the IoT as a whole, all of these typical wireless protocols are being used. "Standards in the IoT space are somewhat in their infancy, but I would expect a bias to Wi-Fi due to its ubiquity in the home, and Bluetooth LE for devices paired with mobile phones taken from the home," says Phil Williams, Principal Architect, Rackspace, who also thinks that Power Line connectivity provides a simple plug-and-play approach when teamed up with an internet-connected gateway device. Cellular connectivity via the mobile phone network dominates in asset tracking, commercial transportation and video surveillance. For instance, AT&T offers a service that uses a SIM card to track a piece of artwork as it's flown between exhibitions, or containers on cargo ships. "Generally these are not seen as communication protocols, but more like types of 'pipes'," says Martin Poppelaars, Vice President of EMEA Sales at global remote IT management company Lantronix, on the subject of Bluetooth, Wi-Fi, cellular and radio frequency. It's rather obvious that Wi-Fi doesn't work well over large areas, such as manufacturing plants and especially when equipment is either mobile or in remote locations, such as oil rigs, wind farms, streetlights and farming equipment. "We're seeing that Wi-Fi is certainly taking the lead for consumer-based IoT solutions, which makes sense – Wi-Fi in the home is ubiquitous and very cost effective," says Nav Dhunay CEO and founder of Canada-based Ambyint, which has developed an IIoT platform for oil rigs. "However in industrial applications that's not the case … the selection of the protocol really comes down to the problem you are trying to solve, and we're finding that both low powered RF and cellular are a good strategy for IIoT." Why is the industrial IoT different? 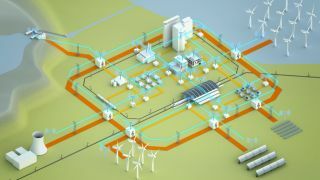 Smart buildings, grids, meters and agriculture are now being constructed across the planet, and it's this Industrial IoT that the likes of Siemens, GE and Rockwell, as well as IT companies like Cisco, Intel, Oracle and Qualcomm, are most interested in. However, Wi-Fi and ZigBee are unlikely to triumph. "While the IoT has evolved with the use of Wi-Fi and ZigBee, these are still limited by battery life, insufficient cell coverage and unmanaged local area networks (LANs)," says Olivier Hersent, the CEO, CTO and Founder of Actility, a provider of network solutions and managed information systems for the Internet of Things (IoT) market. "The IoT on an industrial scale will be about '0G' rather than 4G or even 5G."